Darien's Tommy Watters (3) on the ice during the boys hockey game against New Canaan High School at Darien Ice Rink on Monday, Feb. 18, 2013. If Darien boys hockey coach Chris Gerwig has learned anything in his first two years at the helm, it's that the FCIAC is anyone's conference. Pitted against the likes of Ridgefield, New Canaan and Greenwich, Gerwig and the Blue Wave have been knocking on the door of winning a championship, having made it to the semifinals of both the FCIAC and Division-I state tournaments last season while going 16-2-2. "We've been close to that county championship, but I think we have a very senior, upper-class team this year that has been to the finals the first year, and the semifinals last year," Gerwig said. "I think for us we need to somehow try and stay healthy in crunch time in the playoffs. The guys have put a lot of hard work into this season with the working out, the conditioning, playing in the fall league." 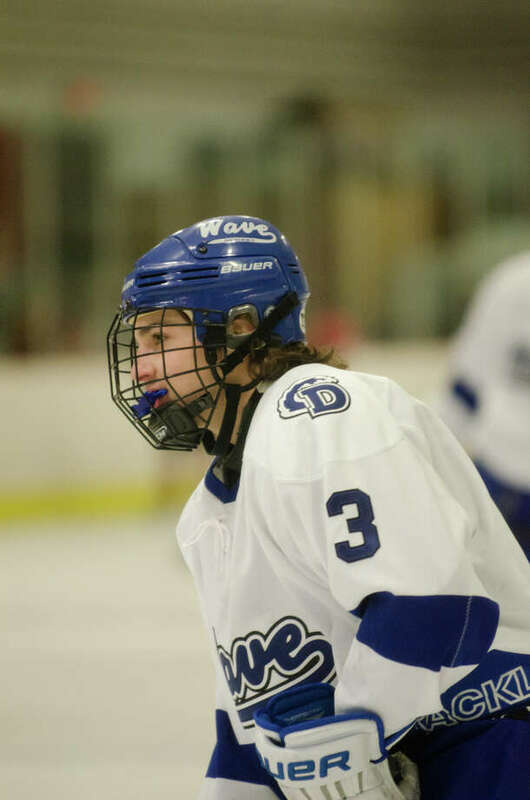 And while several of Darien's top players and biggest scoring threats from last season were lost to graduation, senior captain and forward Owen Koorbusch believes that the Blue Wave return players who are capable of filling the void and then some. "We played pretty well. I think we looked good moving the puck well, and I think we're a fast team. One thing I'd like to improve upon is hitting," Koorbusch said. "That was one thing I was a little worried about because Bergin, Knowlton, Hathaway are great players, so obviously it was a big loss, but we have a lot of great players that are going to step up this year." Darien competed in its first scrimmage on Saturday, a 4-1 win over Notre Dame-West Haven. Gerwig and company are still figuring out line combinations and defense pairings, but the players believe they've begun to build on-ice chemistry to match the camaraderie they share off the ice. "So far, from what I've seen, we're doing pretty good, but there's always room for improvement and we're not going to let down," senior forward and Tommy Watters said. "Scrimmages are a good place to work on chemistry and also to see other teams and how they're doing. You can see the style and size of their goalie." Darien's defense boasts a wealth of experience, as all of its top six defensemen (Nick Allam, Jack Massie, Nick Tuzinkiewicz, Aidan Loh, Brendan Cassidy and Sam Knowlton) from last season return for another shot at an FCIAC and/or state crown. "I've got my top six returning defensemen in place. Line combinations we're still feeling things out," Gerwig said. "We've got some senior forwards that can play at a high level: Tommy Watters, Owen Koorbusch, Robbie Juterbock, Connor Davis, Dillion Fitzpatrick. Juniors are Jack Pardue, Craig Miller as well as Tighe Sullivan." Michael Collins, last year's starting goalie who was instrumental in much of Darien's success, has also graduated, leaving the door open for senior Michael Colon. Will Massie is expected to open the season as the backup. The Blue Wave will jump right into the fire in the first portion of their schedule, as the opening six games will be against Hamden, Fairfield Prep, New Canaan, Notre Dame-West Haven, Ridgefield and New Canaan a second time. Doing so, however, should allow Darien to find out exactly where it stands against fellow FCIAC powerhouses, as well as some out-of-conference competition. "Our first six games are kind of like the gauntlet of the state. Those will be some tough games, fun games to play," senior captain and defenseman Jack Massie said. "I think it's nice that we come out of the gate against really strong teams. We can make sure we're playing our best hockey when the season starts." Darien isn't taking its preseason action lightly, as the players believe it is an ideal opportunity to campaign for playing time as well as get on the same page with line mates. Darien plays in a jamboree on Dec. 14 at Terry Conners before its season-opening clash with Hamden on Dec. 18 at 7 p.m. at the Lou Astorino Ice Rink. "Our first goal is to have a good record in the FCIAC and try to win something there and then get back to (the state tournament final four at) Yale like last year," Allam said.